On August 5, Standard Poor's, led by Jharkhand-born Deven Sharma, struck off the 'AAA' rating of the US, considered the Gold standard in the world of finance, for the first time since 1914. About four months after MS Dhoni's boys won the Cricket World Cup for India, another man from Jharkhand has now shook up the world. On August 5, Standard Poor's, led by Jharkhand-born Deven Sharma, struck off the 'AAA' rating of the US, considered the Gold standard in the world of finance, for the first time since 1914. On that Friday afternoon, S&P officials told Barak Obama's treasury department that the ratings major's analysts have come to a decision that the US no longer deserves to be among the best rated countries in the world. After six hours and a flurry of emails, phone calls and conferences between top officials in the Obama administration and Sharma's team of number-crunchers, the world got to know of the unprecedented move - something that was in the air for a few months but which appeared more like a distant possibility: The US' country rating was downgraded one notch to 'AA-plus'. And suddenly the 57-year old Sharma was in the spotlight, hailed by a select few, but criticized by several in the financial world. 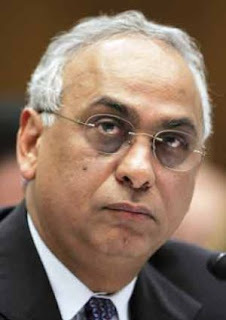 Born in 1955, Sharma was educated in Jamshedpur and Ranchi, and then moved to the US for his masters degree at Wisconsin and his doctoral degree in management from Ohio in 1987. During his initial years, he was in the manufacturing sector, working with Dresser Industries and Anderson Strathclyde. In 1988, he joined Booz, Allen & Hamilton, a global management consulting firm, where he spent 14 years. In 2002, he joined The McGraw-Hill Cos, the parent of S&P. Sharma took over as the president of S&P in August 2007, just when the sub-prime crisis in the US housing sector was getting out of hand, and credit rating agencies were picked as one of the perpetrators of the meltdown for their flawed ratings models of housing loans. Over the last four years as the head of one of the foremost rating agencies in the world, Sharma has faced several US Congressional grillings, but has negotiated most of those with much elan, people who have followed him closely say. In a recent interview, Sharma admitted that over the last four years, comments made by US lawmakers have changed to appreciation from strong criticism. No wonder the veteran of several testimonies in the US congress has been able to stand up to the global criticism from all quarters for their critical decision. Since Friday evening, Sharma, along with David Beers, his top lieutenant on the ratings side, have stood firm alongside S&P's analysts and defended the controversial and unprecedented decision saying that such a step was necessary and it was done for the benefit of investors. People who followed Sharma's recent messages to the world said that there was enough evidence that a rating downgrade was more of a probability than not. Late last month, in a Congressional hearing during the height of uncertainty about raising US debt limit, Sharma was non-committal about what ratings decision his company would take. A Bloomberg report said that he told US lawmakers that S&P was waiting to see what the final proposal would be before deciding whether to keep US debt at the firm's highest ratings level. While the world criticized S&P for their historic decision, some even questioning the data the analysts used but back home there are some who think Sharma and his men have done a great job. The controversial head of a top brokerage house with strong presence in the US told TOI, that the ratings downgrade had to happen as it was due for years.